Before the war, Hechinger Co. was a moderately successful home improvement and building goods company, with several retail locations between Washington D.C. and Baltimore. Richard England joined the company as Chairman, and had overall control of marketing and advertising for Hechinger Co. Under his leadership, the retail group was catapulted to success. In 1972, Hechinger Co. had amassed over 15 retail locations and had expanded its offering to include plumbing and electrical supplies, general hardware items, building goods and home improvement products. The company went public in 1972 and was immediately successful. As a multi-billion dollar corporation, it grew to over 115 retail outlets. Hechinger Co. went on to develop retail locations including shopping malls in previously disadvantaged areas, enticing large anchor tenants and providing much needed retail access in areas that were previously considered ‘no-go’ zones for businesses. Though Hechinger Co. eventually sold its stake and was quickly absorbed by larger national chains, Richard England and his wife Lois moved into the world of philanthropy and charity. Richard spent the rest of his life devoted to a number of causes dear to his heart. The Lois and Richard England Family Foundation, established in 1990, was conceived as a way for the entire family to give back and to use their influence and wealth to serve others. 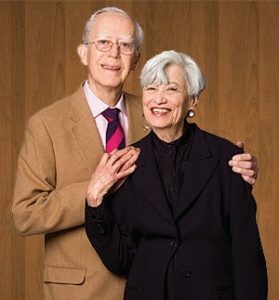 All three of Lois and Richard’s children serve with their spouses on the board of the Foundation, and are actively involved in the daily running of the organization. Two of the core funding programs for the Foundation are ‘D.C. Youth Development and Education‘ and ‘Jewish Community Life’. The former focuses on supporting young people in disadvantaged D.C. communities that are under-served by traditional funding opportunities. The latter provides grants to support Jewish community-based groups both in the U.S. and in Israel. The Foundation has two funding cycles per year as well as a number of personal, discretionary grants that are awarded by individual board members. To date, the Lois and Richard England Family Foundation has awarded more than $10 million in grants to organizations and individuals. When Richard England passed away in 2013 aged 93, an obituary written in the Washington Post noted his work on many different charities and boards, recognizing his deep commitment to philanthropy and the non-profit sector.